Sebastien Ogier wins the Wales Rally GB, the 11th round of the 2018 World Rally Championship. 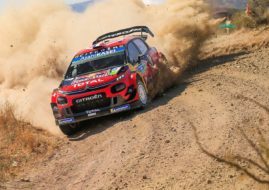 It’s the fourth win of the season for the defending champion in the #1 Ford Fiesta WRC which pr Add Slider omoted him to the second place in the championship standings with two more events on a calendar. With today’s win, Ogier became the record-holder and only man to score five wins at Wales Rally. He previously won four times with Volkswagen Motorsport. Ogier shared the podium with two Toyota Gazoo Racing drivers – Jari-Matti Latvala and Esapekka Lappi. The other points-scorers are Craig Breen (Citroen), Thierry Neuville (Hyundai), Andreas Mikkelsen (Hyundai), Hayden Paddon (Hyundai), Mads Ostber (Citroen), Kalle Rovanpera and Pontus Tidemand (both Škoda). Thierry Neuville (Hyundai) remains in the championship lead with a fifth-place finish in Wales. He collected 189 points so far, seven more than Ogier and twenty-one more than Ott Tanak (Toyota). The Estonian in the #8 Toyota Yaris WRC was the dominant man in the rally, having a lead of 41.9 seconds over Ogier after the Special Stage 15 on Saturday afternoon. Unfortunately for Tanak, he had to stop on SS16 due to a damaged radiator, wanting to prevent a bigger damage on an engine. From that moment, Ogier and Latvala were fighting for the victory. After SS21, Latvala had an advantage of only two-tenths of a second but Ogier was faster on the last two stages and, in the end, he won with a 10.6sec gap. The Wales Rally GB was the place of maiden WRC2 victory for 18-year-old Finnish rally star Kalle Rovanpera. He defeated reigning WRC2 champion Pontus Tidemand and British driver Gus Greensmith in a Ford Fiesta R5. The next WRC round is the RACC Rally Catalunya, scheduled for October 25-28. The championship will end in November at Rally Australia.